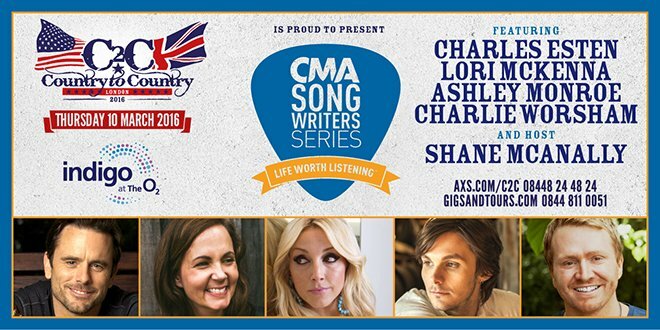 The line-up for the 2016 CMA Songwriters Series at the Indigo at the O2 has been revealed! The event will be hosted by arguably the biggest and best songwriter in Nashville, Shane McAnally, who has written an incredible number of #1 hits and has worked with artists including Sam Hunt, Keith Urban, Kacey Musgraves, Kenny Chesney, Miranda Lambert and many more! Charles Esten, star of the hit TV show ‘Nashville’, will be joining Shane, as well as ‘Girl Crush’ writer Lori McKenna, Charlie Worsham and also Ashley Monroe, who will perform the following day on the Yamaha Stage at C2C 2016. Tickets are still available from axs.com and gigsandtours.com.